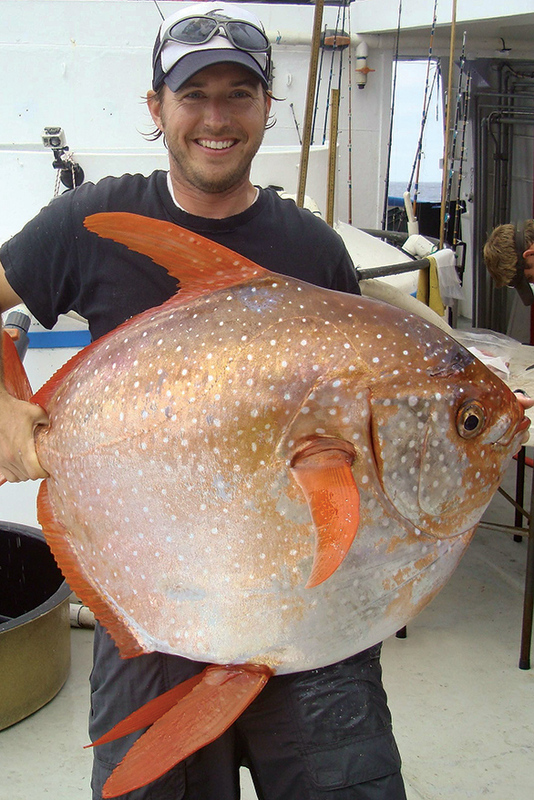 Seemingly a creation from the studios of Dr. Seuss, the opah, or moonfish, has for years been an enigma for marine scientists who could not reconcile its predatory hunting habits with the deep, cold waters of the world’s oceans where it dives to depths of 500m (1,650 ft). Other fish species in these frigid, dark waters are mostly slow-moving ambush predators, their brains and hearts chilled to a lethargic pace. The solitary opah, strangely, can be quick and elusive as it actively chases down smaller fishes and squid that are its main prey. 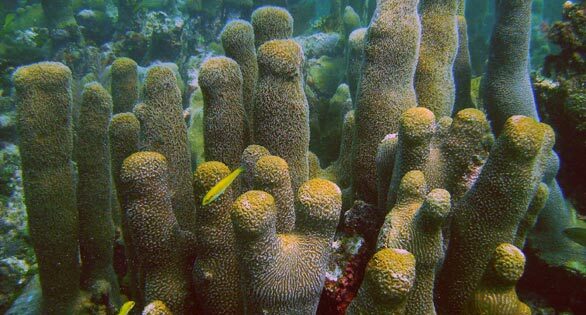 In short, it acts like fish in warm water and shallower depths. How could this be? 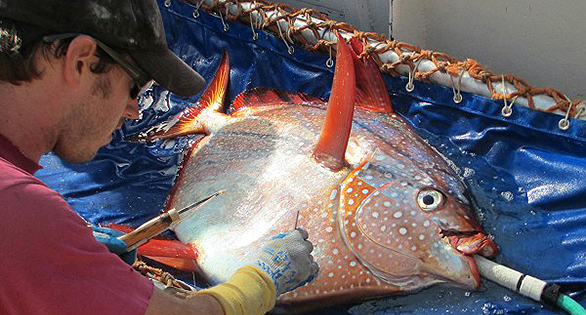 The answer, researchers at NOAA Fisheries have found, is a unique circulatory system that turns the opah into the first-known fish with warm blood circulating throughout its body. Opahs caught in icy 4-degree C (40ºF) water do not show the expected body temperature of 4 degrees, but rather 13-14ºC (55-57ºF). NOAA scientists realized that Lampris guttatus must be circulating heated blood throughout its body (much like mammals and birds), giving it a competitive advantage in the cold ocean depths. The reddish, silvery fish with big eyes is roughly the size of a large automobile tire, and it swims by rapidly flapping its large, red pectoral fins like wings through the water. Other fish that typically inhabit such cold depths tend to be slow and sluggish, conserving energy by ambushing prey instead of chasing it. But the opah’s constant flapping of its fins heats its body, speeding its metabolism, movement and reaction times, scientists report today in the journal Science. NOAA researcher inserting a temperature probe to get readings from a live opah. Image: NOAA. That warm-blooded advantage turns the opah into a high-performance predator that swims faster, reacts more quickly and sees more sharply, says fisheries biologist Dr. Nicholas Wegner (of NOAA Fisheries’ Southwest Fisheries Science Center in La Jolla, Calif.), lead author of the new paper. The opah is of interest to fisheries biologists in part because it is increasingly being recognized as a prized catch with exceptional eating qualities and a species that appears to be holding its own under fishing pressure. Most opah in US waters are caught in the Hawaiian Islands and off California. Wegner realized the opah was unusual when a coauthor of the study, biologist Owyn Snodgrass, collected a sample of its gill tissue. Wegner recognized an unusual design: Blood vessels that carry warm blood into the fish’s gills wind around those carrying cold blood back to the body core after absorbing oxygen from water. The design is known in engineering as “counter-current heat exchange.” In opah it means that warm blood leaving the body core helps heat up cold blood returning from the respiratory surface of the gills, where it absorbs oxygen. Resembling a car radiator, it’s a natural adaptation that conserves heat. The unique location of the heat exchange within the gills allows nearly the fish’s entire body to maintain an elevated temperature, known as endothermy, even in the chilly depths. 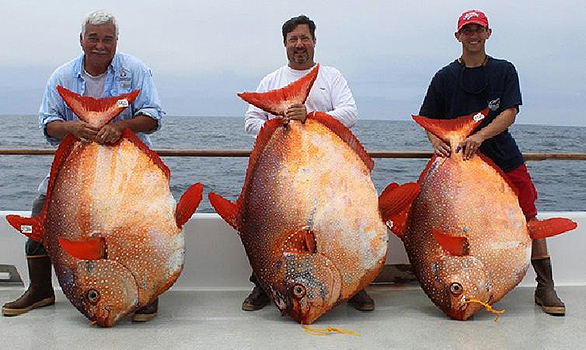 Fishermen with 125-lb (57 kg) opah caught off San Diego from the half-day charter boat, Davy’s Locker. The researchers collected temperature data from opah caught during surveys off the West Coast, finding that their body temperatures were regularly warmer than the surrounding water. They also attached temperature monitors to opah as they tracked the fish on dives to several hundred feet and found that their body temperatures remained steady even as the water temperature dropped sharply. The fish had an average muscle temperature about 5 degrees C above the surrounding water while swimming about 150 to 1,000 feet below the surface, the researchers found. A few other fish, such as tuna and some sharks, warm certain parts of their bodies such as muscles, boosting their swimming performance. But internal organs, including their hearts, cool off quickly and begin to slow down when they dive into cold depths, forcing them to return to shallower depths to warm up. Satellite tracking showed that opah spend most of their time at depths of 150 to 1,300 feet, without regularly surfacing. Their higher body temperature should increase their muscle output and capacity, boost their eye and brain function, and help them resist the effects of cold on the heart and other organs, Wegner said. Fatty tissue surrounds the gills, heart, and muscle tissue where the opah generates much of its internal heat, insulating them from the frigid water. Opah or moonfish, a roving pelagic predator that moves from about 50m to 200m, sometimes as deep as 500m. 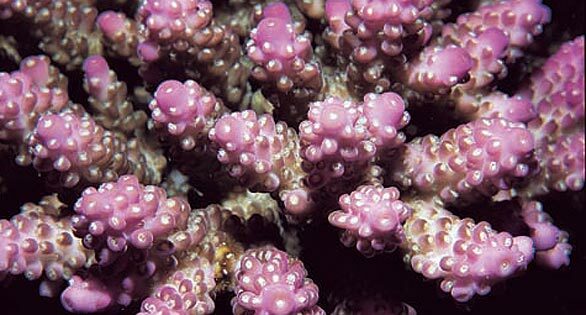 Image: Ralph Pace for NOAA. Other fish have developed limited warm-bloodedness (known as regional endothermy) to help expand their reach from shallower waters into the colder depths. But the opah’s evolutionary lineage suggests that it evolved its warming mechanisms in the cold depths, where the fish can remain with a consistent edge over other competitors and prey. Recent research has found distinctive differences among opah from different parts of the world, and Wegner said scientists are now interested in comparing warm-blooded features among them. 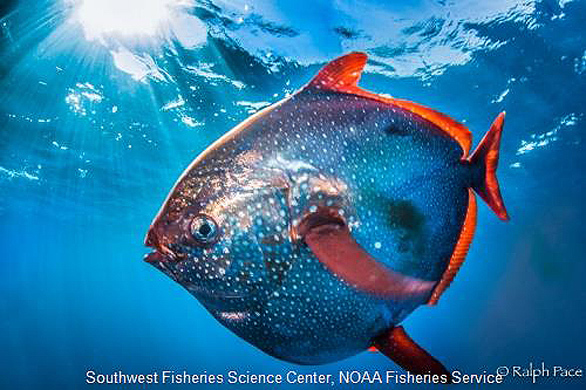 NOAA research surveys off California have caught more opah in recent years, but biologists are not sure why. Current conditions may be favoring the fish, or their population may be growing. 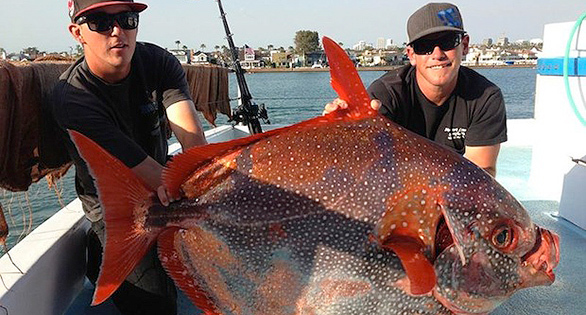 Opah are not usually targeted by fishermen off California, but local recreational anglers and commercial fisheries occasionally catch the species. The opah’s rich meat has become increasingly popular in seafood markets.